Sushma Swaraj said that she has asked Indian mission in Munich to take care of the couple's two children. The Indian man died, his wife is stable, Sushma Swaraj tweeted. An Indian man died and his wife got injured after they were stabbed by an immigrant near Munich in Germany, Foreign Minister Sushma Swaraj said on Saturday. "Indian couple Prashant and Smita Basarur were stabbed by an immigrant near Munich. Unfortunately, Prashant has expired. Smita is stable. We are facilitating the travel of Prashant's brother to Germany. 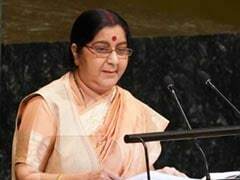 My heartfelt condolences to the bereaved family," Ms Swaraj tweeted. The Foreign Minister said that she has asked Indian mission in Munich to take care of the couple's two children. "I appreciate the good work by @cgmunich. I have asked our mission to take care of their two children," said Ms Swaraj. Ms Swaraj, a tech-savvy minister, uses the social media to reach out to Indians abroad who are in distress. Earlier this month, Ms Swaraj had put out an appeal on Twitter after four Indians were killed in the Ethiopian Airlines crash. "I am trying to reach the family of Shikha Garg who has unfortunately died in the air crash. I have tried her husband's number many times. Please help me reach her family," the minister had tweeted. This was one of her many tweets to reach out to the families of the Indians who died in the crash.